Eight teams competed at Twin Valley South and Brookville High School over the three-day stretch of games which can often offer early previews for the upcoming boys basketball season. Carlisle showed potential to have a strong season by going undefeated over the course of the three days while Twin Valley South also showed promise, finishing 5-1. Preble Shawnee and Eaton each finished 2-4. 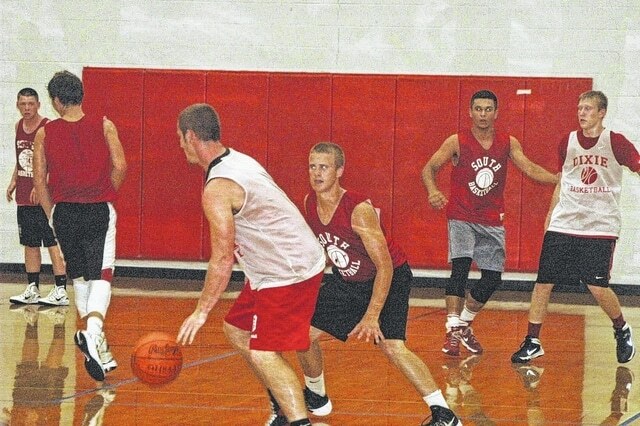 WEST ALEXANDRIA — Twin Valley South and Brookville hosted the annual summer league for varsity basketball on Monday, June 29, Tuesday, June 30 and Wednesday, July 1, where Carlisle went undefeated over the six game stretch. Twin Valley South won five games and losing to Carlisle to finish with the second best record. Brookville, the other host team, finished with four wins but forfeited two games tying them for third with defending Division IV state champion Tri-Village who also finished with four wins and two losses. Tri-Village is coming off an undefeated state championship season, but looks to replace a large portion of the team. Preble Shawnee won two of their six games to tie with Eaton for the fifth best record. Eaton finished with two wins despite the ongoing search for a head coach for the program. They were coached by JV coach Randy McKinney during camp, open gyms and the games at TVS and Brookville over the week. Milton Union won one game to finish in seventh and Dixie found themselves in the basement of the summer league standings, failing to win a game. This year Augspurger used the system to evaluate players who are battling to make the varsity squad this fall. According to Augspurger, summer league was started in 1994 by one-time Brookville head coach Scott Caudill. The eight-team format started in the late 1990s when Twin Valley South began hosting because the school had two playable gyms. Caudill stepped down at the same time and Augspurger took charge of the league. Augspurger continued to say the league has recently cut down in size, and teams like National Trail and Tri-County North also acted as host teams during the summer league’s history. Along with North and Trail, Arcanum, Franklin Monroe, Northridge and Miami East were all members of the league at one point in time. The league also had more games in the past, but coaches decided to cut down on the games to avoid playing teams multiple times. The tournament will be held Wednesday, July 8 at Brookville High School starting at 5:30 p.m.